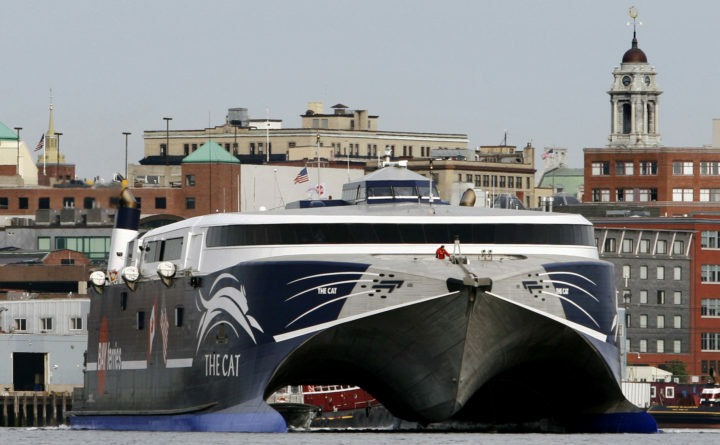 The high-speed Cat ferry leaves Portland Harbor bound for Yarmouth, Nova Scotia, in this June 2009 file photo. Bay Ferries, which operates the ferry, is pushing ahead with plans to base the service out of Bar Harbor this summer despite delays caused by the state and U.S. governments. A Canadian ferry company continues to make plans to operate service between Bar Harbor and Nova Scotia this summer and end a three-year run between Portland and the Canadian province. Bay Ferries had an option for another year on a lease it held on the Ocean Gateway terminal in Portland, where it has operated for the past three years, but decided not to exercise that option, Bay Ferries CEO Mark MacDonald said Friday in an email. The company’s lease at the Portland facility lapsed at the end of December. The company has negotiated a lease agreement with the town of Bar Harbor but has not signed it yet for two reasons: The state still owns the property on Route 3 that the ferry company would use as its terminal, though the state has agreed to sell it to the town, and the company has not yet reached a deal with U.S. Customs and Border Protection on the share of the agency’s projected operating costs at the terminal the company will have to shoulder. Having operational approvals from the federal agency are a requirement for signing the proposed lease between the company and Bar Harbor. The agency’s operating costs at the Portland terminal, and how much of it the ferry company was to pay, posed a hurdle to Bay Ferries’ CAT ferry resuming service in Portland in 2018. After initially requiring up to $7 million in upgrades to the city’s terminal, Customs and Border Protection later agreed that $1.5 million to $2 million in upgrades would be sufficient. Bay Ferries and the provincial government of Nova Scotia, which heavily subsidizes the ferry service, ended up paying for the improvements. The current shutdown of the U.S. government means that Bay Ferries has been unable to continue discussions with the agency about those costs in Bar Harbor, and about significant renovations needed at the customs building, which has been idle since 2009. But MacDonald said he does not expect the ongoing delay to prevent ferry service across the Gulf of Maine from resuming within a few months. The town, in the meantime, still is waiting to close on its purchase of the property from the Maine Department of Transportation. The terms of the sale were negotiated more than a year ago, and then approved by Bar Harbor voters last June, but attempts late last year by then-Gov. Paul LePage to amend the deed and the subsequent change in gubernatorial administrations have pushed back the closing date, which had been scheduled at the end of November. Cornell Knight, town manager for Bar Harbor, said last week that Gov. Janet Mills’ pick for transportation commissioner, Bruce Van Note, has said the state hopes to close on the sale by the end of January. “Bay Ferries and the province [of Nova Scotia] still are very committed to coming to Bar Harbor,” Knight told members of the Town Council on Tuesday. Even without a signed lease or approvals from Customs and Border Protection, however, Bay Ferries has gotten the go-ahead from Maine Department of Transportation to start work on some demolition projects at the property.